Many people consider having their porch screened, but don’t know about all the benefits screened porches offer. And right now during the cold winter season, it’s the best time of year to have screened porches installed; that way, they’re ready for spring. If you’ve been considering a screened porch for your home, keep reading to learn all the benefits. A screened porch adds additional space to your home for things. While you may not store some things outside due to the risk of rain or wind, outdoor storage is an option for screened porches. You can have furniture, appliances, and more safely stored on your screened porch without worrying it may become wet or hit by debris in a strong wind storm. With the ability to have furniture on your porch shielded from the elements, a screened porch is also a great place for entertainment. A screened porch also provides additional protection from the sun and from insects, so you and your guests won’t have to worry about that when having a nice conversation on the porch. It’s nice to enjoy the weather outside without having to worry about weather or pests running amuck. You no longer have to enjoy the snow or spring rains from indoors. You can enjoy nature’s beauty without worrying about you or your deck becoming weathered by the elements when you have a screened porch. Watching the leaves fall without them blowing onto your porch is also a plus, and of course a screened porch serves as an excellent insect barrier during the summer. 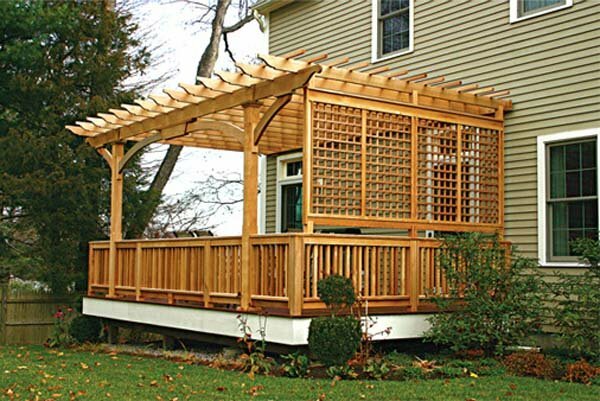 Screened porches have benefits to offer for all seasons, making them a great choice with uses all-year-round. When looking for a screened porch in Maryland, you want to know your contractor has experience and expertise in that area. By choosing a company like Freedom Fence and Home that has years of experience, you can be assured you will receive quality service, guaranteed. Freedom Fence and Home, which services the Harford County area, provides vinyl fence and vinyl fencing services for homeowners who want to improve the look, and value, of their homes. Our crews are highly trained and have been performing construction for years. You can view our gallery to familiarize yourself with our work. If you have any questions about installing a screen porch, please contact Freedom Fence and Home by calling 443-271-6841 or visit our website. You can also follow us on Facebook and Twitter! This entry was posted on Wednesday, December 2nd, 2015	at 1:25 am	. Both comments and pings are currently closed.